Satyakam Phukan, a Guwahati-based general surgeon and the person, who first raised the issue of incorporating Assamese as a separate script in the Unicode, has written a letter to Pritam Saikia, Commissioner & Secretary to the Government of Assam, Cultural Affairs Department, opposing the invitation to Michael Everson to Assam by the Government as a waste of public money and time. The Government has invited Everson for drafting a proposal for a separate slot for Assamese script in the ISO: 10646 Standard. Citing his reasons for the opposition, Phukan stated that Michael Everson was one of the persons, who drafted the Unicode Standard, which was later synchronised with the ISO: 10646 Standard and that he was also one of the main persons who were responsible for the deletion of the Assamese script from the ISO: 10646 along with some of the officials of the Indian Government namely Om Vikas, Swaranlata and others. Secondly in July 2012, when Phukan had raised the issue of the Assamese script in the Unicode Forum, Everson had responded with very unparliamentary comments on the Assamese script and also about the Assamese people. Phukan has also attached the relevant pages which contain the comments of Everson with the letter to Saikia. Phukan with help from a group of Hungarian computer experts, who had also been the victims of the activities of Everson and the Unicode, had lodged a complaint with the ISO on June 14, 2014. The ISO officially reprimanded Everson for his behaviour. A copy of the email informing about the same from the ISO had been attached with the letter. The letter further said that even now, the suggestion for renaming of the Bengali code chart had been drafted as an ad-hoc proposal by Everson himself, which was claimed as cutting of the ice by the delegates from Assam to London, but Everson did not on any ground agree to the proposal for separate slot/range for the Assamese script. Besides, Everson was not willing to encode the ??? (Khya). 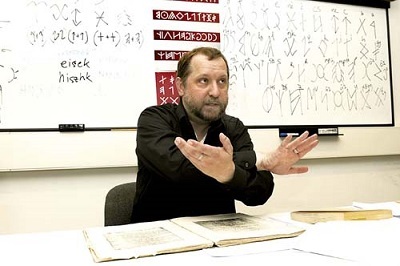 The letter further said that Everson had categorically stated that the Unicode Standard had got nothing to do with transliteration but the CLDR of the Unicode follows the ISO: 15919 Standard in its transliteration guidelines, which is nothing but adoption of double standards on his part. The letter asked Saikia to consider the decision to invite Everson after evaluating all the facts provided to him so that no public money is wasted illogically for an undeserved or non-required person.